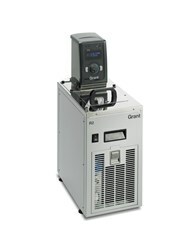 The Grant Optima™ TC120 R series of refrigerated baths and circulators with digital control provides excellent value for money for more demanding applications requiring accurate heating and cooling in the range of -25 to 100°C. The TC120 immersion thermostat incorporates Intelligent Control Optimisation (ICO)™ for adaptive intelligent PID temperature control and includes a powerful integral pump, making TC120 series refrigerated systems suitable both for immersing samples and circulating temperature controlled fluid to external devices. It includes a convenient timer function for reaction timing and a variable high temperature alarm setting. The temperature range and heater power are automatically limited according to the liquid type selected. Note: The refrigeration unit can be switched off indepedently of the thermostat to allow heating only applications. All the refrigeration base units can be used up to a maximum temperature of 100°C.